Mary Meeker’s presentation this week on mobile shone light on the mobile monetization problem and argued that “ad$ follow eyeballs, it just takes time.” However, she failed to address the reason for the mobile monetization issue and missed the clear implications for anyone looking to seize the opportunity. Mobile is exploding. Over 100 million people in the US have smartphones, consumers are spending over 60 minutes a day consuming media on these devices, and people glance at their phone about 40 times a day. That is a massive and very active user base. You would think that advertisers would be rushing to take advantage of this untapped goldmine of an opportunity to reach consumers. However, as Meeker showed there is a huge discrepancy in the amount of time people spend on their phones and the number of advertising dollars allocated to mobile. The mis-equilibrium numbers vary, but estimates range between consumers spending 10% to 24% of their media time on mobile and advertisers putting only 0.5% to 1% of their budgets there. To many this is the great mobile opportunity. They theorize that the discrepancy in mobile spend means that advertisers are slow to catch on and that as they do a tidal-wave of money will flow. That is the hope of the Facebooks and Pandoras who are getting crushed in the equity markets because they are living and breathing proof that having lots of pageviews in mobile does not equal lots of money. I personally disagree strongly that if you build it, they will come. Advertisers and their agencies are not stupid. They all have smartphones, they all live and breathe their iPhones and Androids, and they are paid to understand what is new and exciting. Mobile is taking no one by surprise in 2012. So why isn’t the money flowing to mobile? Advertisers know that the golden ticket to performance is relevance, and by that I mean the ability to target and reach your potential customer base as accurately as possible. I live in Los Angeles, and you are going to have a tough time trying to sell me snow boots in the summer. The more you can target the ads, the more likely you can generate the desired action and the more successful the campaign. 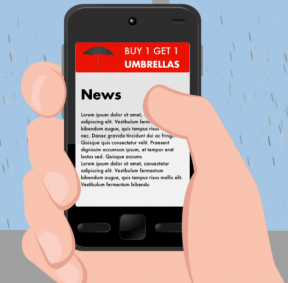 The current mobile eco-system allows almost no targeting criteria and demands that advertisers take a spray and pray approach to their campaigns. This leads to poorly performing campaigns and unhappy advertisers that are unwilling to keep pushing more money down the rabbit hole that is mobile. Why are mobile campaigns so lacking? The answer most people give is that cookies, which are the mechanism used in the online ad world, don’t work on mobile. Without getting into the technical reasons as to why this is the case, I challenge the argument because even if cookies did work I still don’t think you would see an advertising windfall. Fundamentally, cookie targeting lets advertisers build a profile about your browsing history and retarget you based on that data. However, in mobile the use case is different and this advertising paradigm starts to break. Using myself as a datapoint of one, when I am on a computer I tend to research specific items and create a browsing history that is rich with information and clearly paints a picture of my intents. However, on mobile my browsing and app history is sporadic and incoherent. I pick up my phone when I have time to kill, when I want to look something specific up, or as part of my everyday. Trying to create a profile from this activity would lead to few actionable insights. If we look back at the historical evolution of ads on digital mediums, it becomes clear that what we are living with mobile is nothing unique. When the first search engines emerged some 15 years ago, they were all slapping ads on their homepages and not really offering advertisers a great product. It was all about their reach and inventory and not at all about their targeting efforts. Then Overture and Google came along and started to tie the ads to the search terms people were typing in and advertisers finally had a targeting parameter that directly led to intent. And the money started flowing and flowing and flowing. A few years later banner ads on websites were still struggling along. Advertisers knew people were online, but very little money was spent advertising to them because the only advantage to this medium was scale and reach (and some accountability). And then the cookie revolution emerged and advertisers could target people based on their browsing history. Advertisers jumped on the opportunity and the industry grew, and grew, and grew and is now about a $25 billion dollar a year industry. So what is the campaign type that makes mobile go pop? As I think about mobile. the opportunity to close the gap between time spent and advertising spend is clearly in finding the right targeting parameter that gets advertisers stoked. It is not just about waiting and hoping, but about figuring out what really makes mobile work. Many have talked about location, and the reasons are obvious. Mobile is a device that is portable, that people carry with them 16 hours a day, and that they look at 40 times a day as they interact with the real world. Not only that, but most smartphones have a built in GPS and can provide very targeted location information. However, most in the industry think of location as a geo-fence. The idea that you can target nearby people with relevant ads based on what is around them. But mobile and location is about so much more. It is about understanding where people are, what they are doing, and what is happening around them. The guys who understand the concept of mobile best are the street vendors in New York City. They set-up carts on the street corners and they sell all sorts of items like DVDs and sunglasses and purses. But when they feel a few drops of rain, they all quickly flip their carts over and start selling umbrellas. This is a brilliant sales strategy because they are adjusting their marketing based on what people are doing (walking around NYC) and what is happening around them (it is raining) to deliver a message and product that really resonates. With mobile and the use of location, advertisers now have the same opportunity. Using location capabilities marketers can infer a lot about what people are doing. If they are in an airport they are likely travelers, if they are in a shopping mall they are likely shopping, and so on and so forth. And because the advertiser can know where they are delivering the ads, they can also tell things about the environment and context of the person seeing the ad such as the weather, traffic, and nearby events. This creates a massive opportunity to tailor each and every message and finally begins to unlock the power of mobile ads. The opportunity is immense, but location is not without its problems. The industry is immature and running these campaigns is not easy. There are privacy considerations that advertisers need to be mindful of. The tools to track and report on metrics are still being developed. But fundamentally, to get real performance from mobile and to unlock the pent up budgets of advertisers, we need to truly understand what makes mobile unique and play to its strength. Location and portability are that opportunity. A propos de l’auteur : Eli Portnoy is the CEO and co-founder of ThinkNear, which helps advertisers target mobile ads based on location and real-world context.